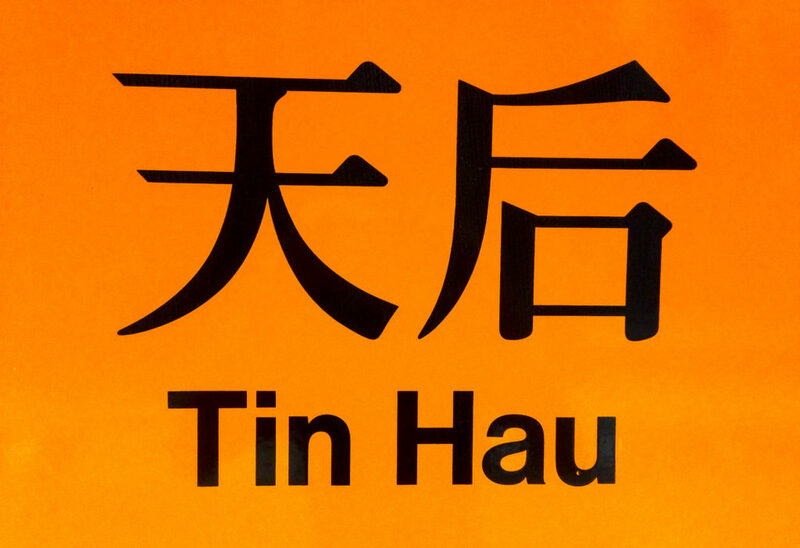 In Hong Kong, you can’t escape the name Tin Hau. Everywhere you go, the goddess follows you. 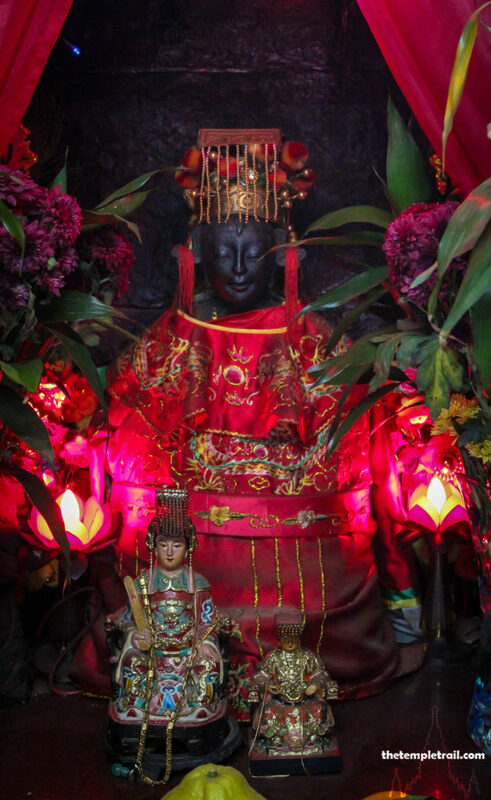 Of Hong Kong’s three hundred plus temples, more than eighty are dedicated her. So who is Tin Hau? Tin Hau is the Cantonese name for the Empress of Heaven (天后 Tiān Hòu). She is a Chinese goddess who is not only popular in Hong Kong, but has a strong claim for the most worshipped goddess in the world, with a few hundred million followers. Her temples can be found anywhere the Chinese went from California to Japan. Her influence is particularly strong in the South of China which is completely understandable based on her origins and what she is responsible for. Tin Hau hails from the island of Meizhou in Fujian Province, where she is known by the name “Mother Ancestor” (媽祖 Māzǔ). 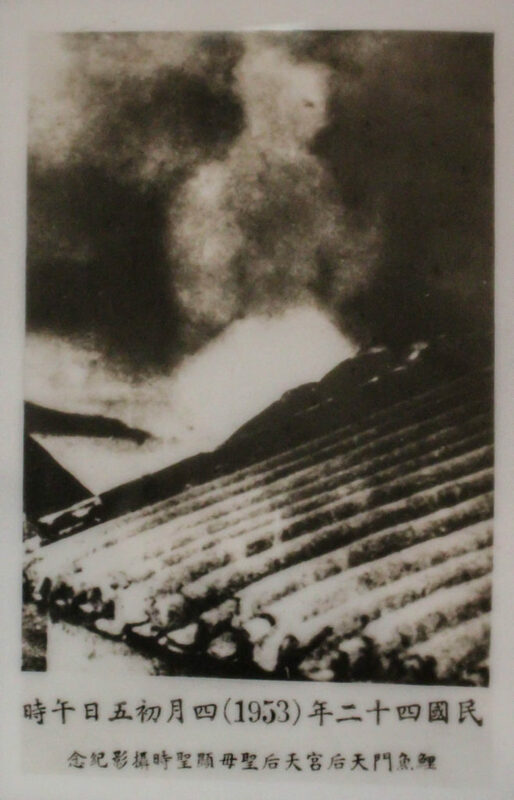 Her story says that she was a mortal named Lín Mòniáng (林默孃). Born in around 960 CE to the Lín family, she was given the name Mòniáng, meaning “Silent Girl”, as she did not cry as a baby. The Lín family, like the others on the island, fished for their living and her father and brothers would go out on the boat every day. In the meantime, she learned the womanly arts, such as weaving and also studied Taoism and practiced Buddhism. One morning, Mòniáng’s father and brothers went out to sea as usual. While the local fleet was out, a terrible typhoon struck. At the same time, Mòniáng fell into a trance while weaving. In this state, she astral projected to sea and picked up her father and brothers. As she was bringing them back, her mother woke her, causing her to drop one of her brothers. The next day, only her father and all but one of her brothers returned, while all of the other fishermen were lost at sea. The story the goes on to say that at the age of 27, she ascended to heaven to take her place among the immortals. Historically, she was likely a local shamaness who was so revered in life, that after her death, the islanders continued to ask her for help. Soon after her death, she became a local goddess to the fishermen of her island. They saw her as a sea deity and protector of sailors. 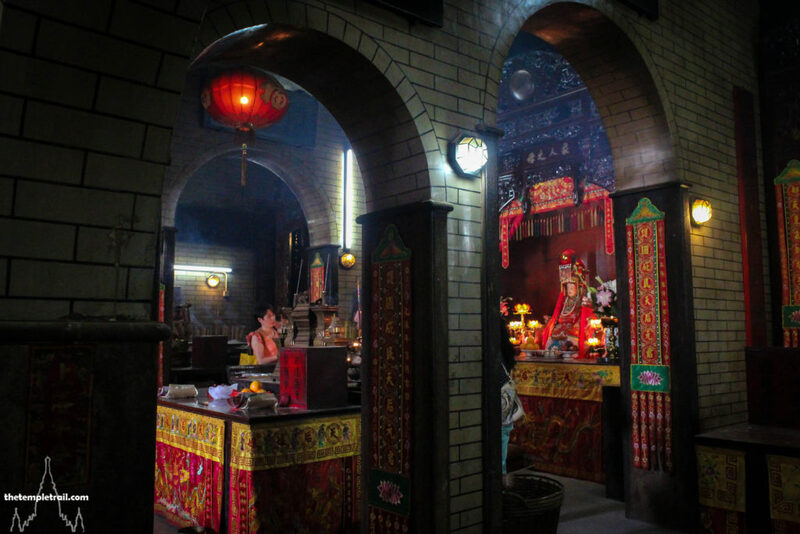 The family’s small ancestral temple, where she had been enshrined following her death, began seeing non-family members coming to worship her. As her popularity increased and fame spread, the temple grew and more halls were added. 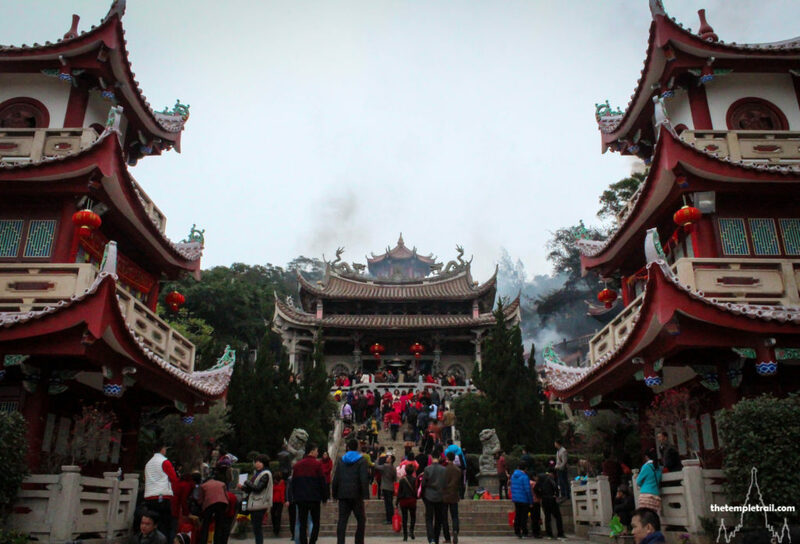 All over Fujian and Guangdong, more temples started to appear. Once the goddess’ powerful reputation started, it escalated fairly quickly, creating the cultic worship known as Mazuism. Reports of the goddess intervening during crises at sea and appearing to help those in need circulated among the sea-faring communities of Southern China. Even the great Ming dynasty Muslim admiral of the Treasure Fleet Zhèng Hé (鄭和) was devoted to the goddess and kept a shrine to her on his ship. Through the successive Song, Yuan, Ming and Qing dynasties, emperors gave her grander and grander titles. The Imperial household of China never actively worshipped the deities of Chinese Folk Religion (Shenism), preferring instead to stick to the doctrines of Confucianism, Buddhism and Taoism. It paid, however, to keep the people happy, by endorsing their popular gods. This is how, as her prominence grew, she went from a local goddess to Heavenly Consort (天妃 Tiān Fēi) and finally to Tin Hau, the Empress of Heaven. While her rank increased, her responsibilities did not change and she still had domain over the seas. The sea is the reason for her popularity in South China. In the southern part of the Middle Kingdom, sailing and fishing were way of life for the majority of the population. 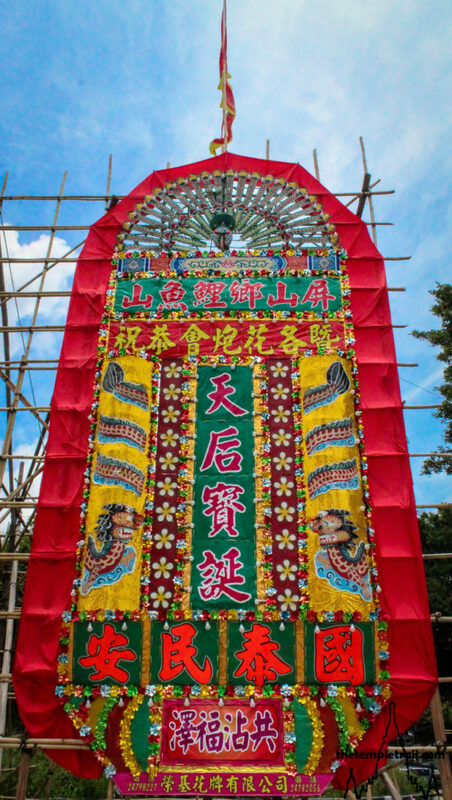 While there are many sea gods in the region, such as Tam Kung and Hung Shing, something about Tin Hau captured the hearts of the seafaring Southerners. All of the ethnic groups adopted her, not just her native Hoklo people. Hong Kong was not only a fishing community in its own right, it was a magnet for Chinese families who wanted to make their fortunes off the sea and eventually on the back of British trade. Groups from all over China came to the territory and as they did, they built temples to the goddess to protect their endeavours on the waters. Tin Hau’s birthday is on the 23rd day of the 3rd lunar month. On that day, all of her temples in Hong Kong are alive with activity. In Hong Kong, you are never far from the sea. That means you are never far from Tin Hau. As land has been reclaimed, some formerly sea-front temples have found themselves inland. 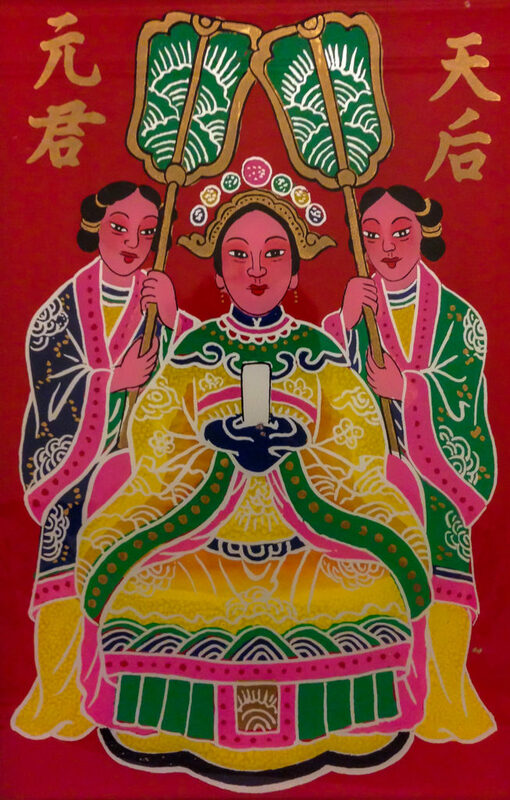 So whether by the coast or in the city, you can see the goddess, accompanied by her demonic guardians Thousand Li Eyes (千裡眼 Qiānlǐ Yǎn) and Favourable Wind Ears (順風耳 Shùnfēng Ěr), wherever you go. Though she is not a native of Hong Kong, like most of its other inhabitants, she has become very much settled into the territory. If you don’t know Tin Hau, you don’t really know Hong Kong at all. This article was originally published on the now defunct Hong Kong Temple Map website.